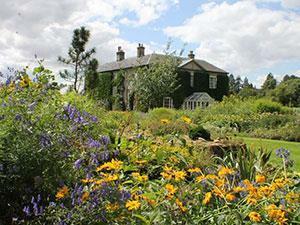 Bressingham Hall01227 464958work Self-cateringWill see the beauty and creativity of the splendid manicured gardens. The Grade II listed mansion house stands proud and handsome, the striking ivy-covered façade a sight to behold. Bressingham Hall is set in 12 acres of beautiful tended gardens that flourish throughout the seasons. The pretty rural landscapes of the Waveney Valley of South Norfolk can be enjoyed on foot or by bicycle from the edge of the grounds. The hall is self-catering but for a truly relaxing stay, catering is available from traditional home style food to fine dining. A grand staircase leads you to the spacious bedrooms which are superbly lit by natural light, thrown through the large original sash and bay windows. Tall ceilings adorned by chandeliers, beautifully decorated and furnished bedrooms with period furniture and brand new king size beds or convenient singles for teenagers and children. Full size single guest beds pop up to deliver even more sleeping options, with a cot available for tots. En-suite bathrooms for all but one of the bedrooms give guests a great deal of privacy. Super-sized double walk-in showers and gorgeous roll-top baths lend to the feel of utter decadence. Pretty, intricate and decorative fireplaces grace each room, a wonderful feature saved from years ago. Dado rails, mouldings and some floorboards have been sympathetically preserved. The furnishings complement and reflect the bygone era. Will see the beauty and creativity of the splendid manicured gardens. The Grade II listed mansion house stands proud and handsome, the striking ivy-covered façade a sight to behold.